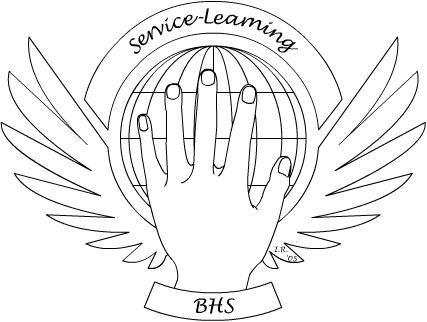 Reminder: All summer service hours will be due on Friday, September 25th, to Mrs. Sosely. Please see her with any questions ro concerns you may have. Bernards High School recognizes the need to develop, in all students, a sense of social responsibility, in addition to a commitment to their academic and co-curricular endeavors. By providing students with numerous opportunities for service to local and global communities, we believe that we will help students to achieve their full potential as active and productive members of society. Students are required to complete 10 hours of service each year for a total of 40 hours to graduate . Each year that the hours meet the requirement an "S" for satisfactory will appear on his/her transcript. If the hours are not completed a "U" for unsatisfactory will appear. Students can complete more than 10 hours a year. However, the hours do not roll from year to year. Therefore, a minimum of 10 hours must be submitted each year in compliance with the new guidelines and by the established deadlines. If a student does not meet the 10 hour requirement, the following year the student must complete 20 hours in order to maintain an "S" for satisfactory on his/her transcripts. Please see the full policy in the student handbook. Last Friday in September: Documentation of service performed in the summer is due. Friday before first semester exams begin: Documentation of service performed during the first semester is due. Second Friday in June: Documentation of service performed during the second semester is due. ** If you would like for your volunteer organization to be added to the Suggested List, please contact me via email- asosely@shsd.org . Might you be looking to volunteer some time through the Bedminster Township's Camp Bedminster program this summer? If so, check out this flyer HERE and be sure to fill out and submit the accompanying application. Consider volunteering through the Interfaith Hospitality Network of Somerset County, as they are currently in need of students to volunteer their time to support the homeless families in our neighborhoods. While there are a range of ways in which you can assist, please do not hesitate to call them directly for more information: 908-704-1920. CONSIDER JOINING THE PG FIRE DEPT! Looking to get involved? Interested in serving your community and helping to save lives? If so, consider volunteering for the Peapack-Gladstone Fire Department. There are many ways in which to volunteer. If interested, please do not hesitate to see Ms. Sosely for contact information. Please consider donating a gently used, clean coat for the 23rd annual NJ Cares Coat Drive . Boxes for drop-off will be available in the main office and you may also consider volunteering at a sorting center on December 15th. If interested, please contact vanessa@jerseycares.org. The Township’s historic Jacobus Vanderveer House is looking for community service volunteers in 8th grade through high school for our upcoming Colonial Christmas event between 11/24- 12/2. Please see the attachment for more information. Please consider volunteering this holiday season! The Bedminster Charities organization is looking for Adult and Student Community Service Volunteers for Bedminster’s annual Fall Fest event on Saturday, October 27th. If interested, please register at www.signup.com or click here. October 14th @ 1 p.m. Interested in helping to raise money for Sloan Kettering Cancer Center? If so, register to take part in the 3rd Annual "3 for a Cure" Shooting Contest, taking place on Saturday, November 17th. The registration deadline is November 2nd, so come in to the Guidance Office for your form, or call (908)304-5279 or e-mail 3foracure@gmail.com for more information. Family-friendly event celebrating Autumn in the country with hay rides, music, games, vendors and food. Calling all volunteers! The annual fair is approaching and they are in need of students to help throughout the day in order for the event to run smoothly. There are many different shifts to choose from, including set-up, face painting, recycle tent, directing cars, making scarecrows, take down and more! Help for a few hours or all day. Please sign up now! Volunteers will receive a RHA t-shirt to wear during the event. Snacks provided all day long. 1. Bake 3 dozen of your favorite cookies at home. 2. Drop off your cookies, along with the official entry form of $10 on Friday, December 7th, between noon and 5 p.m ,at Good Shepherd Lutheran Church, Somerville. One dozen will be judged; the other 2 dozen will be sold at Saturday's bake sale. 3. Preliminary judging takes place Friday evening and the top 5 bakers in each category will be notified by 8 p.m. on December 7th. Final judging will take place on Saturday, December 8th at Williams- Sonoma, Commons Mall, Bridgewater. Questions? Visit ihnsc.org/bakeoff or call 908-707-1921.
boxes of books weighing up to 40 lbs. Light refreshments will be provided. 9:00 a.m. - 1:00 p.m., 1:00 - 5:00 p.m., and 5:00 - 9:00 p.m.
9:00 a.m. - 1:00 p.m. and 1:00 - 5:00 p.m.
boxes weighing up to 40 lbs., moving tables, and boxing books for storage. Click HERE to find out more information about volunteering for Community in Crisis. Because hunger doesn't take a break, the Community Soup Kitchen & Outreach Center will be open every day, serving 18,000 breakfasts and lunches from June through August and distributing 120,000 pounds of food through our Free Farmer's Markets. Will you please help us? Summer is the season when donations drop off, but the need increases, as many children who don't have access to school lunches depend on us until September. Consider volunteering and e-mail nancy@cskmorristown.org today. The Superior Court of NJ Somerset Vicinage is looking for youth volunteers, age 14-18 for its Juvenile Conference Committee. Youth volunteers play a crucial role on the Juvenile Conference Committee by providing their point-of-view on these matters that come before the courts. Volunteers receive full training from a program coordinator, after which they have the opportunity to sit on a panel appointed by a Family Diviison judge to hear and decide matters involving juvenile offenses. Parental consent is required of all youth volunteers. Please consider volunteering, as it would add a unique point of interest to any college application. Interested individuals can go online to www.njcourts.gov, search Volunteer Services, click on the county in which you are interested volunteering, and complete the application located on the website. If you have questions about the volunteer opportunities at the Judiciary, please contact the training coordinator and volunteer liaison directly at meredith.novkovic@njcourts.gov. Volunteer, Have Fun, Give Back! No such thing as a free lunch? Yes there is -- and it's from Chipotle! All H.S. students are invited to grab a friend or two and come along! Bring joy and hope to individuals suffering from substance use disorder with holiday packages you create. All materials supplied. Come help, eat, give back, smile. See you there! Questions? Email us. An after-school academic support program hosted by St. Bernard’s Church, in partnership with the Somerset Hills YMCA, is seeking additional volunteers to sign up this summer before the program resumes with the fall start of classes in the Somerset Hills School District. The program, taught by high school students and adult volunteers, is free and offers homework help, academic support and computers with internet access to area students in grades K-8. Adults and high school students wishing to volunteer are required to be registered as a volunteer through the YMCA, a simple and free procedure but one that can take a few weeks to process. For high school students, the program can count toward community service hours. This is an opportunity for students to share their knowledge, gain leadership skills and give back to the community. Additional volunteers will help ensure consistent coverage, ideally with one volunteer for every student. A larger pool of volunteers will also enable flexible scheduling so volunteers can come when available and won’t have to commit to a fixed schedule. The program runs through the school year and is held in a classroom in St. Bernard’s Parish House on Tuesdays and Wednesdays. For young elementary children who do not have homework, the emphasis is on developing reading and math skills through the use of grade-appropriate workbooks and other learning materials. Students seeking academic help can just drop in - no appointments are necessary. The Parish House, located at 88 Claremont Road, is within walking distance of Bedwell Elementary School, Bernardsville Middle School and the Bernards High School. St. Bernard’s launched this satellite learning initiative as part of its community outreach efforts, with a particular focus on providing resources to local Latin American residents. For more information, contact Jessica Bruno at the YMCA, (908) 766-7898 ext. 544, or Alison Davidson at St. Bernard’s Church at (908) 766-0602. The Bernardsville Fire Department is looking for volunteers. If interested in becoming a part of the team, visit them at the firehouse on Monday nights from 7:00- 8:00 p.m. Also, you can go to join22fire@bernardsvillefire.org, as well, to get more information about membership. Attention all students: The YMCA and St. Bernards Church are working together to hold tutoring sessions for K-8 students at St. Bernards Church. If interested, please contact 908- 766-7898 for more information and sign-ups. You are invited to join the 2018-2019 Tutoring & Science Program. We are looking for students (grade 8-12) and adults to serve as Math and English tutors and Science mentors to elementary students from Neighborhood House, a community social service program located in Morristown that serves a diverse population. The 2018-2019 tutoring & science program will be led by experienced teachers using an enriched curriculum. The 2018-2019 Tutoring Program at Neighborhood House was a huge success. We doubled the number of students to 36 and tutors to 25. Everyone had fun and everyone learned a lot! The second to fourth grade students who faithfully attended each Saturday morning, the tutors from surrounding high schools, the program staff at Neighborhood House -- all shared good times as the the students improved in reading and math and learned about the Scientific Method by building and testing Balloon Racers and Sinking Ships! This year we are adding an exciting robotic Creature Challenge sponsored by Lego for the older children. We are looking for 8 special tutors to run the 4 science teams. The tutoring & science program meets on Saturday mornings from 10:00 AM-12:00 noon from September 2018 through May 2019 (not on holidays or vacations). We understand that today's student is often engaged in sports, music or other activities that make a year-long commitment on Saturday mornings extremely difficult. The tutoring program has been structured so that conflicting obligations can be resolved with the help of substitute tutors or by a family “sharing” one child. Very few volunteer opportunities available to high school students provide a chance to make a direct positive impact on a child's life. Tutoring not only provides a valuable service to the community, it is recognized universally as a commitment to the common good. Join the team and help those with special needs.... If you have an interest in working closely with staff and other volunteers to form a successful team to support riders and their families, then we have the opportunity for you! Volunteerism can range from 1-5 hours a week during the 6-12 week sessions throughout the year, or you may volunteer for the summer camp as well. You can go to www.manstreamnj.org or call Sarah at 908-439-9636 x 204 for more information.